Located 25 km east of Lyon, Lyon-Saint Exupéry Airport is currently France’s 2nd-largest regional airport for commercial aviation. It welcomed nearly 10.3 million passengers in 2017, compared with 9.5 million in 2016. 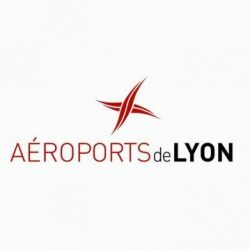 Lyon-Saint Exupéry airport is ideally located, close to downtown Lyon thanks to the Rhônexpress light rail line (30 minutes), major freeways and the Part-Dieu TGV high-speed train station. Recent highlights concerning Lyon Saint-Exupéry Airport include 10 new routes in 2017 with 7 new destinations that had not been served until now: Tenerife South, Saint Petersburg, Rouen, Nuremberg, Las Palmas de Gran Canaria, Oujda and Essaouira. In addition, other new routes should come into service in spring 2018 with Transavia, EasyJet and Volotea for destinations such as Palermo, Catania, Tel Aviv, Rennes and Mallorca. 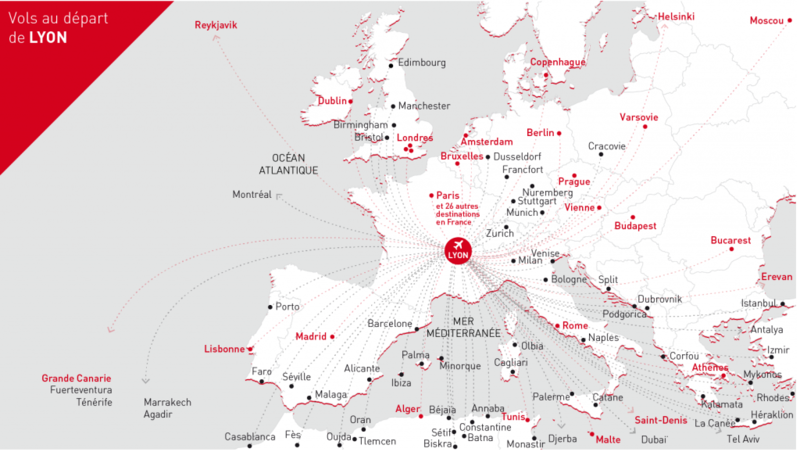 In 2018, Lyon-Saint Exupéry Airport offers 120 different destinations, including 85 cities via non-stop flights, with service from 44 airlines such as Aegean, Air France/KLM, Flybe, EasyJet, Eurowings, Pegasus, Tunisair and Vueling. If you wish to travel to Austria, you can fly to Vienna. For the Balearic Islands, you can fly to Ibiza, Palma de Mallorca and Menorca. For Belgium, non-stop service to Brussels is now available. For Croatia, you can fly to Dubrovnik and Split. For Crete, you can reach Heraklion and Chania. For The Czech Republic, now boarding to Prague. For Denmark, one destination is available: the capital, Copenhagen. For England, you reach Birmingham, the three London airports and Manchester. For Finland, the capital, Helsinki, is now served. If you wish to stay in France, you can reach Ajaccio, Bastion, Bergerac, Biarritz, Bordeaux, Brest, Brive-la-Gaillarde, Caen, Calvi, Châteauroux, Clermont-Ferrand, Figari, La Rochelle, Lille, Limoges, Marseille, Metz, Nantes, Nice, Paris, Pau, Poitiers, Rennes, Rouen, Strasbourg, Toulon and Toulouse. If you wish to go to Germany, you can fly to the cities of Berlin, Düsseldorf, Frankfurt, Munich, Nuremberg and Stuttgart. For Greece, you can fly to Athens, Corfu, Kalamata, Mykonos and Rhodes. For Hungary, non-stop service to the capital, Budapest, is available. For Ireland, now boarding for Dublin! For Iceland, you can reach Reykjavik. For Italy, choose Bologna, Cagliari, Catania, Milan, Naples, Olbia, Palermo, Rome or Venice. For Madeira, Malta, Montenegro and The Netherlands, you can reach Funchal, Valletta, Podgorica and Amsterdam. For Poland, you can choose between Krakow and Warsaw. For Portugal, you can fly to Faro, Lisbon and Porto. For Romania, you can fly directly to the capital, Bucharest. For Russia, you can reach Moscow. For Scotland, now boarding for Edinburg! For Spain, you can choose Alicante, Barcelona, Madrid, Malaga and Seville. For Switzerland, one destination is served: Zurich. If you wish to travel to Algeria, you can reach Algiers, Annaba, Batna, Biskra, Béjaïa, Constantine, Oran, Setif and Tlemcen. For the Canary Islands, you can fly to Fuerteventura and Tenerife. For Morocco, you can reach Agadir, Casablanca, Essaouira, Fes, Marrakech and Oujda. For Réunion Island, you can take a non-stop flight to Saint-Denis. Finally, for Tunisia, you can fly to Djerba, Monastir and Tunis. If you wish to travel to Armenia, you can take a flight to Erevan. For Turkey, you can reach Antalya, Istanbul and Izmir. If you wish to travel to Israel, you will soon be able to fly non-stop to Tel Aviv. For the Unites Arab Emirates, you can fly to Dubai. If you want to travel to North America, you can take a flight to Montreal, Canada. For Guadeloupe, you can fly directly to Pointe-à-Pitre.